Before I share today’s Monday Munchies, I wanted to take the time this Memorial Day to express my unwavering gratitude and awe to those who currently serve or have served our nation as one of its military – especially those who sacrificed it all so that we can live free. From those who made this nation free in the Revolutionary War to those that we have lost in our most recent battles to keep our nation free, thank you does not seem nearly adequate enough for what you have given us and given up for us. 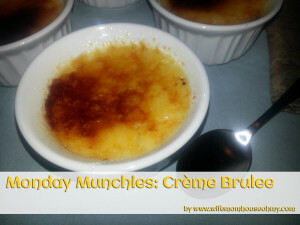 My all time favorite dessert ever is crème brulee. If it is on a menu, I’m ordering it. Its a toss up as to what I love more – the crispy caramelized amber colored sugar top or the light and frothy creamy custard hidden beneath that sugar shell. I love it so much that four years ago my husband bought me ramekins and a brulee torch as a present. I’m sure part of his doing so was to get me to make some so he could eat it. Sadly, he had to wait until today for me to make him some. See, the recipe is probably one of the easiest recipes out there in my book BUT the time involved is pretty lengthy, as you will see by the instructions. From start to finish its about a 3 1/2 to 4 hour process. Not that you are working that whole time but it does require planning. Well, he got lucky. On Saturday while we were out celebrating a friend’s anniversary of her 29th birthday at Room 5 Lounge here in LA, I ordered their crème brulee. Probably one of the best I have ever had. (Actually, I will admit I’m pretty snobby when it comes to food and I would say Room 5 Lounge ranked from a food standpoint in my top 5.) I got inspired with the flavor and the Memorial Holiday. I always like to do something special on holidays and for this Memorial Day, since I would be at home anyways, I decided on crème brulee. Needless to say, though time consuming, it was definitely worth the effort. If your family likes yogurt, pudding, custard or flan, then they will love this crème brulee recipe. Honest. 1. Preheat your over to 325 degrees F.
2. Using a small custard cup, a storage container such as Tupperware and the large mixing bowl, separate egg whites from egg yolks. This is how I learned to separate eggs. Over the custard cup, crack the egg and break in half, making sure the egg stays in one side of the shell. Let the egg white drain down the side of the egg into the custard cup. 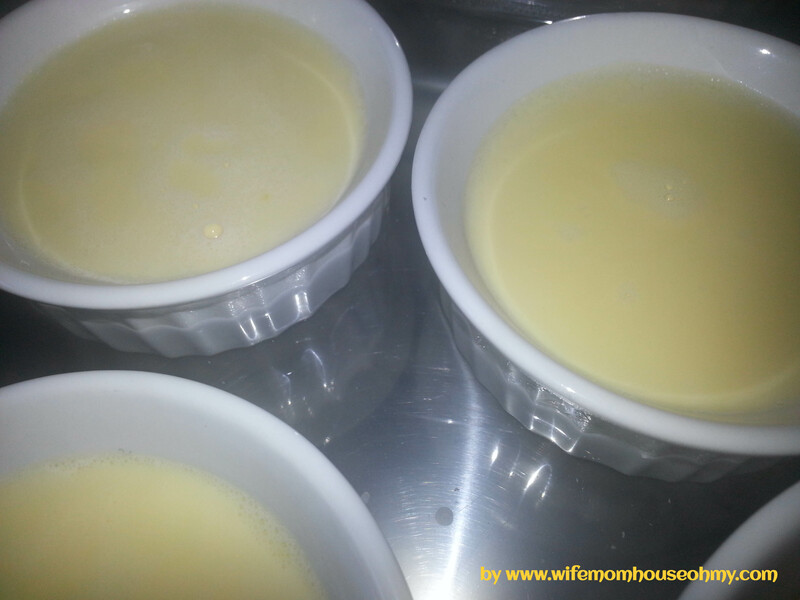 Keep transferring the yolk back and forth between egg shell halves until all the egg white is in the custard cup. Put the yolk in the large mixing bowl, trash the shell and transfer the egg white to the Tupperware. Repeat for the remaining 5 eggs. This way if something goes wrong, you have not loss all of your previous yolks (or egg whites depending on the recipe). Set yolks aside. I typically use the whites for scrambled eggs the next day. 3. Put cream and 3 tablespoons pure vanilla extract in to the medium sauce pan. Combine well and bring to a bowl over medium-high heat. 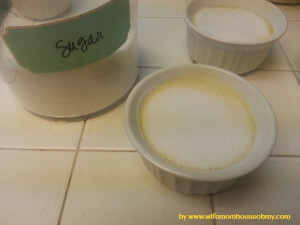 Stir frequently to prevent sticking to the pan or thickening film on top. Turn off the heat. 4. Add 1/2 cup of the sugar, pinch of salt and 1 tablespoon of pure vanilla extract to the yolks. Whisk until well combined. Should lighten in color slightly. 5. Temper the cream solution into the yolk mixture. You do this so you do not cook the egg yolks or cause them to curdle. 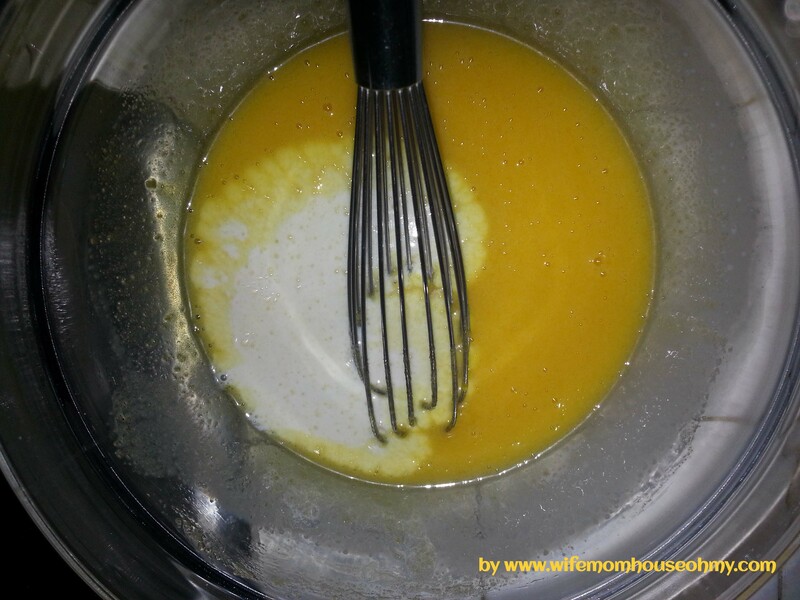 To temper, add two ladles of the cream mixture to the yolk mixture. Whisk until well combined. 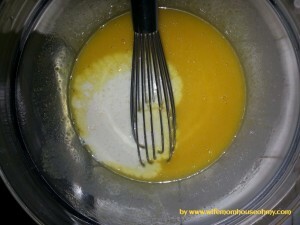 Repeat using two ladles of cream at a time until all the cream has been added to the yolk mixture. The custard cream should be a pale yellow when done. Tempering the yolk mixture is simply slowly adding the cream to the egg mixture. 6. Place the ramekins inside the roasting pan. Pour even amounts of the custard cream into each ramekin. Add boiling water into the roasting pan being careful to not splash the custard. Fill until the water is half way up the ramekins. The recipe makes 6 but if you only have 4 ramekins as I do, then use one large for the remainder of the custard. 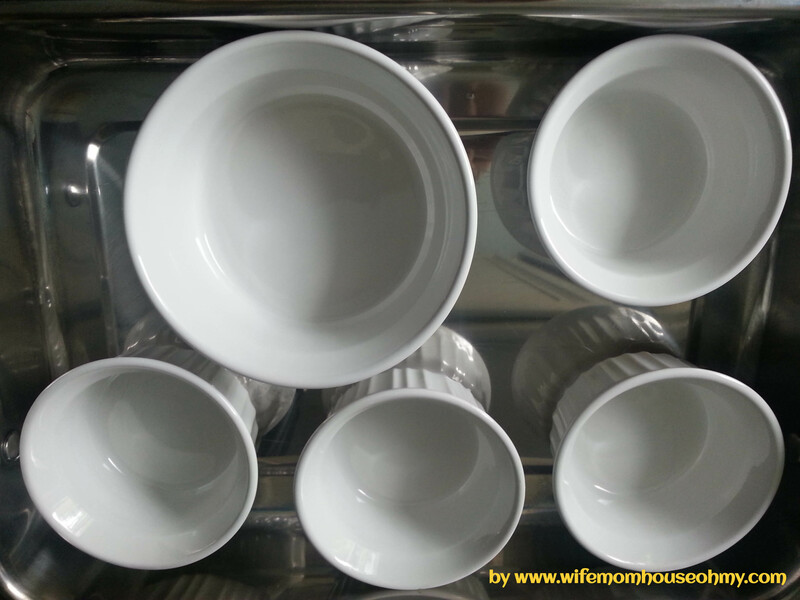 Your water should be about 1/2 up the side of the ramekins. 7. Place in oven and bake for about 40-50 minutes or until the custard is set but still slightly trembling in the center. 8. 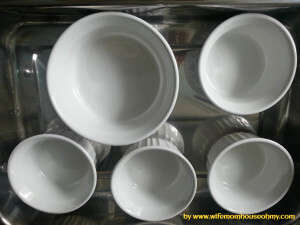 Remove ramekins from roasting pan on to cooling rack to slightly cool off. Do so with either oven mitts (preferred) or tongs. Once touchable, transfer to the fridge for about 2 hours. The custard will fully set as it cools in the fridge. The custard should be set but tremble slightly in the center when done cooking. 9. Before serving, transfer to freezer for 15 minutes to ensure the custard is cold when served. Remove from freezer and let sit for 15 to 30 minutes before serving. Sprinkle tops with 1 1/2 tablespoons of sugar per custard. Using a brulee torch, caramelize the sugar by making slow circular motions about 1 to 2 inches above the sugar until the sugar melts, turns to an amber color and is smooth. 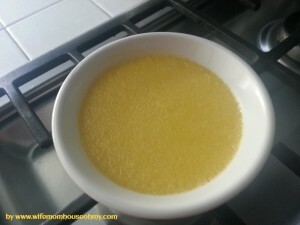 Sugar should cover entire top of custard for torching. Caramelized sugar should be smooth, amber in color and melted. Note: Ramekins are hot immediately after. 10. Serve and wait for the yums and sounds of delight coming from guests and family. As I said, it actually is pretty easy, just time intensive. But the delight it will bring your family, friends and guests is worth the extra effort and decadence. If you try my crème brulee recipe, give me a shout out and let me know what you and your family think. 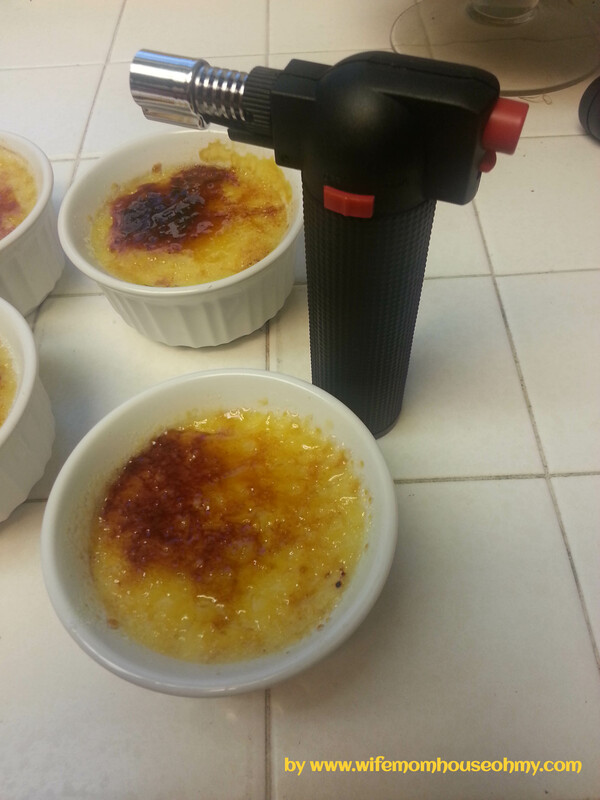 Note: If you do not have a brulee torch, you can make a modified version. Instead of white sugar, sprinkle the tope with brown sugar and melt under the broiler. You have to watch it very closely and it won’t have the exact same crystalized crust but it will taste yummy too!